Don’t Let Congress Waste America! Our country is facing a nuclear waste crisis. With over 70,000 tons of the most deadly waste ever created piling up at nuclear power plants all over the country, Congress and the Trump administration are proposing false solutions that will only worsen the crisis. Help us Stop Congress from Wasting America! Your donation today will be matched. Their plan is to make over 10,000 shipments of lethally radioactive nuclear waste through 44 states and the District of Columbia on our roads, rails, and waterways, just to dump it in places that cannot store it safely. Congress is proposing short-sighted, false solutions such as the unsuitable Yucca Mountain, which is a seismically and volcanically active area in Nevada, and new “consolidated storage” depots, which could become de facto permanent dumps. This is a major fight for real solutions, and if we don’t start mobilizing now, communities throughout the U.S. will be at risk of radiation exposure and catastrophic accidents, from tens of thousands of radioactive shipments. We know you are with us and we need your help to launch this campaign! Make a donation — however much you can — to make sure we can get the word out and start mobilizing now. Nuclear waste policy in the US truly is broken, and the nuclear industry’s false solutions sound seductive to short-sighted politicians. It’s time to wake them up! We recently launched our Don’t Waste America petition calling on Congress and the Trump administration to find scientifically-proven, publically-acceptable, and ethically-chosen nuclear waste solutions, but that alone will not be enough. Over the next ten weeks, we need to raise $40,000 to get the campaign off the ground. 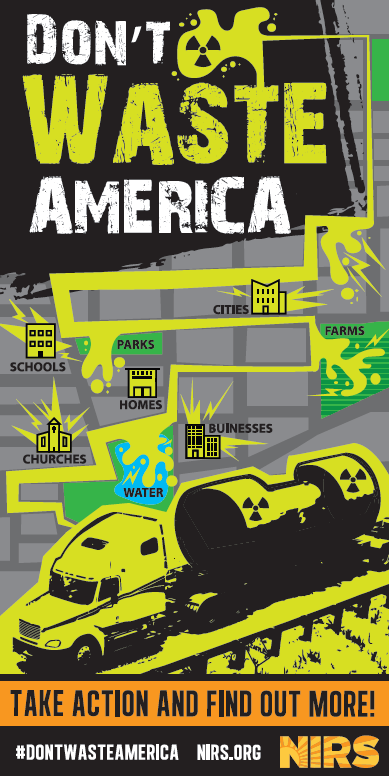 We need to reach more and more people throughout the country, and show Congress and this administration that we don’t want their radioactive waste transported through our cities and farmlands. The good news is your donation will go twice as far toward making that happen because another generous supporter is offering to match every dollar you contribute, so your support will be doubled. Please give what you can to Stop Congress from Wasting America. And stay tuned for other actions you can take in the coming weeks! As always – thanks for all that you do!